"Retour à la nature!" (Back to nature!) is a dictum misattributed to Jean-Jacques Rousseau. In the popular imagination, "going back to nature" means to restore to man the state of nature, to place him outside every oppressing bond of society and the prejudices of civilization. 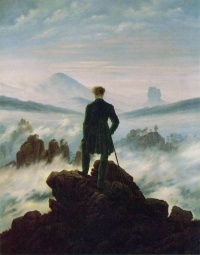 The idea was particularly important in Romanticism. In France the expression "back to nature" is only rarely heard in studies on Rousseau, see Rousseau scholar Robert Thiéry who says: "En France, il est très rare de rencontrer «le retour à la nature» dans les études sur Rousseau." Voltaire, who had felt annoyed by the first essay [On the Arts and Sciences], was outraged by the second, [Discourse on the Origin of Inequality Among Men], declaring that Rousseau wanted us to "walk on all fours[...]" like animals and behave like savages, believing them creatures of perfection. From these interpretations, plausible but inexact, spring the clichés Noble Savage and Back to Nature. Unless indicated otherwise, the text in this article is either based on Wikipedia article "Back to nature!" or another language Wikipedia page thereof used under the terms of the GNU Free Documentation License; or on original research by Jahsonic and friends. See Art and Popular Culture's copyright notice. This page was last modified 10:48, 14 April 2015.